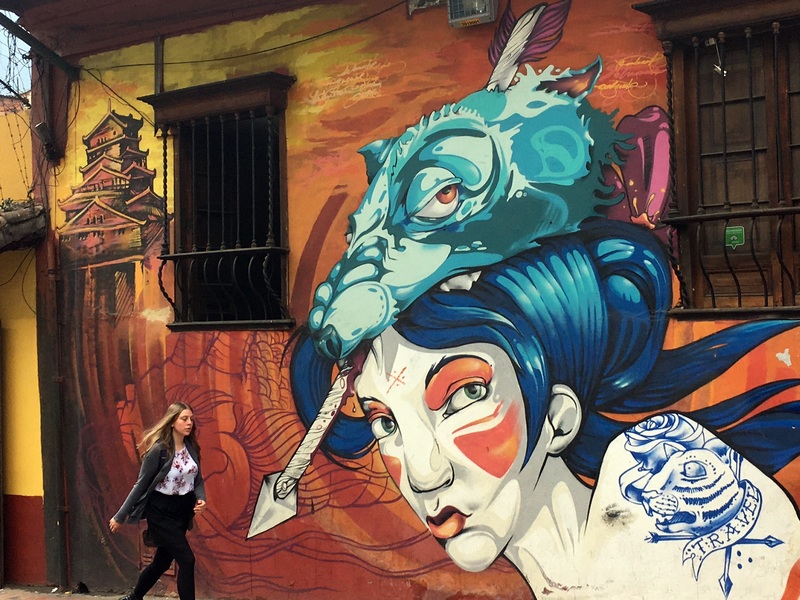 We challenge you: Take the Bogota Graffiti tour! The best way to discover the “hidden” colorful side of the city. We arrived in Bogota on a rainy afternoon to spend the last three days of our Colombia trip. Looking at the clouds and the moody gray sky, I started feeling nostalgia for the Caribbean heat and the sun we left behind in Santa Marta that same morning. The taxi from the airport slowly made its way through the 9-million capital struggling with crazy traffic. Sorry, Bogota – it was not love at first sight. The city didn’t strike me with any beauty or typical architecture. It seemed huge, gray and dull. In my opinion, it definitely lacked character comparing to all Colombian cities we had visited so far. It took us one hour to get from the airport to our hostel in La Candelaria. That’s where the picture became a little more optimistic. La Candelaria is the city’s old town. 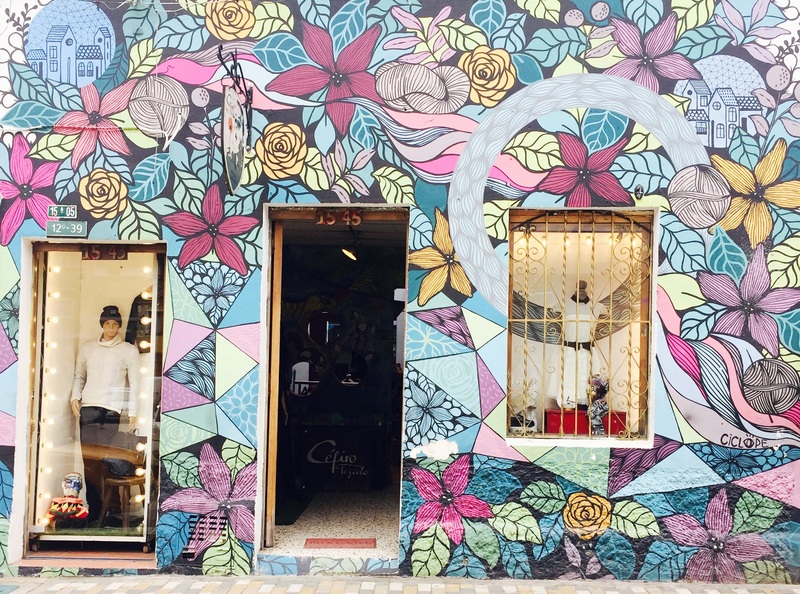 Over the years, it has succeeded in keeping the authentic vibe of Bogota alive. Full of old colorful houses, vintage shops, signature cafes, and French pastries (why French? 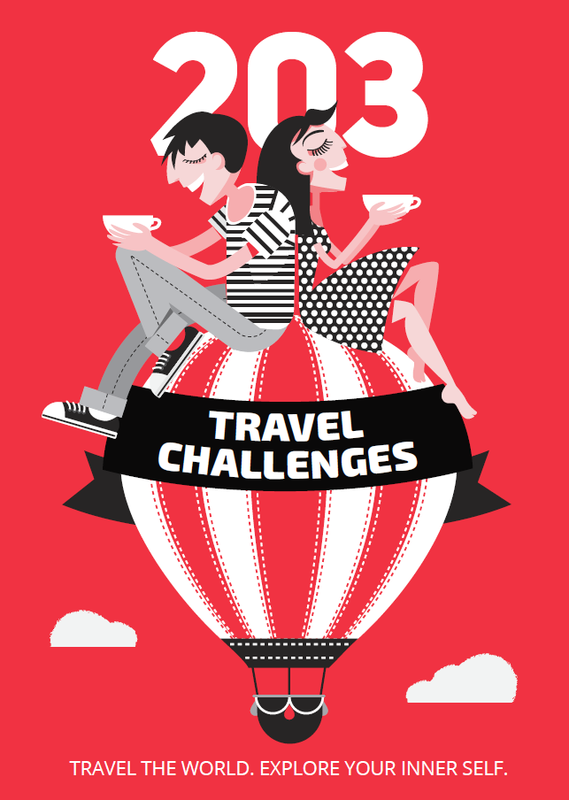 Because of the large number of French expats). Churches, museums, and cozy restaurants follow. What’s more, many of Bogota’s universities are located within the old neighborhood giving it a pinch of youthful spirit. 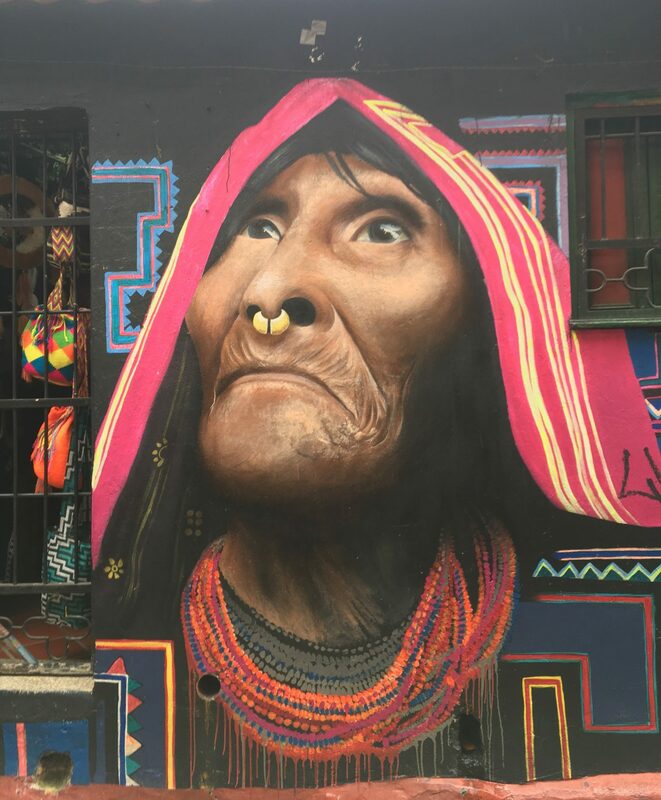 Actually, what made a significant difference in the atmosphere was the widespread street art scene and culture in La Candelaria. We were surprised by the amazing graffiti artwork gazing at us from every corner. 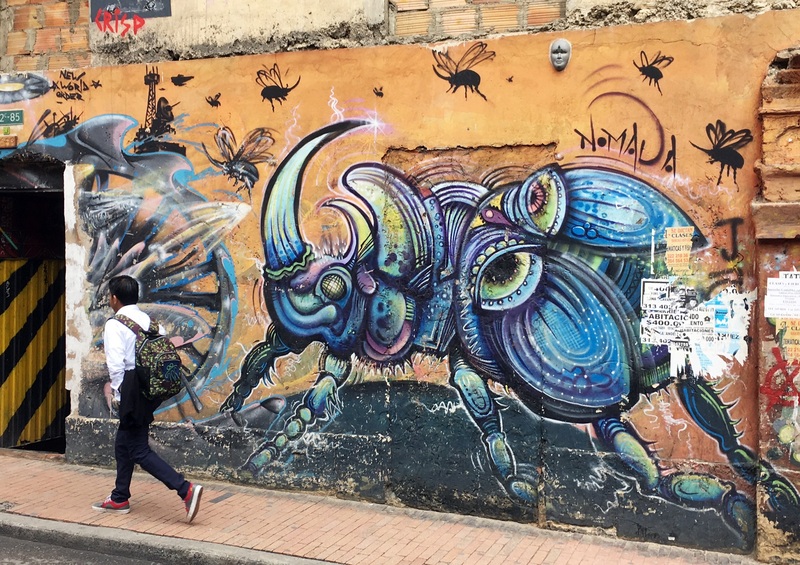 I had read a little bit on the topic beforehand and it turned out Bogota was big on graffiti – one of the world’s hotspots. I sure wanted to learn more. 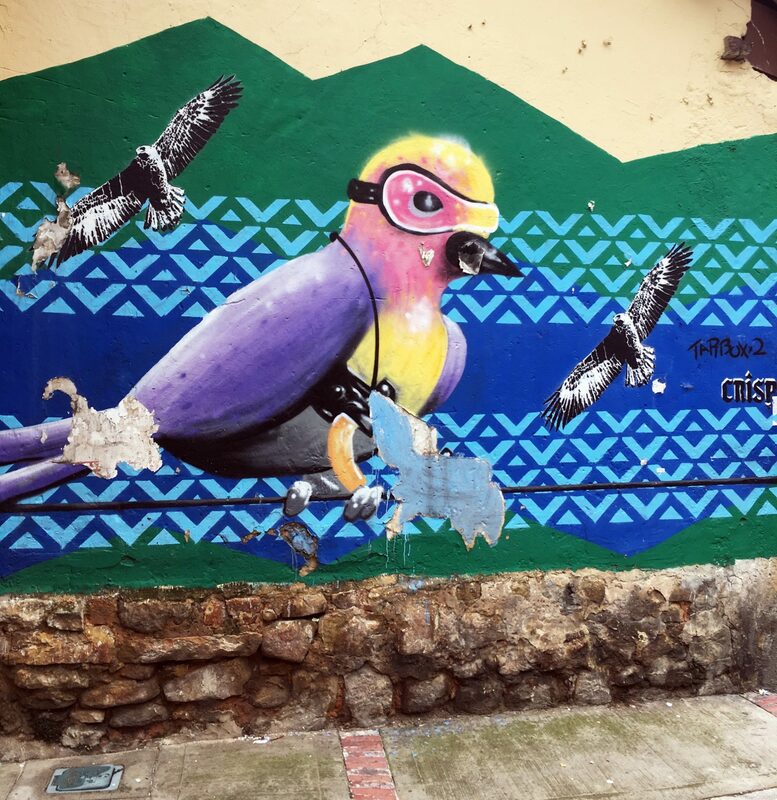 We found out the best way to get to know the local street art is to join the Bogota Graffiti tour. It’s the original and authentic tour that takes place in the streets of La Candelaria. 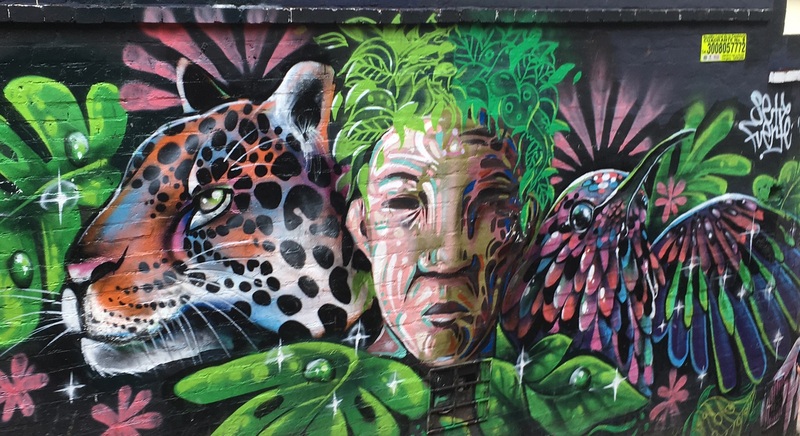 It started back in 2011 when an Aussie street artist and a Canadian graffiti writer decided to share Bogota’s unique urban art scene and help promote local artists to a wider international audience. The tour is run by street artists for free, but like any other free tour – it is based on tips. They’ll show you around the old town where most of the graffiti works are located. You’ll be awed by the themes, dimensions and bright colors. At the end, if you’re satisfied with the story behind the mesmerizing images, it’s up to you to decide what the tour is worth. The tour starts and wraps up in the Journalist Park (Parque de Los Periodistas). Our guide was a German girl who had been living in Bogota for the past 10 years. Along with the interesting graffiti facts, she was happy to share a lot of information on culture, the political scene, and history of the city. It was nice of her to recommend good restaurants, bars, and cafes that we passed by along the way. She also pointed out street art galleries where we could find more graffiti art or look for pieces of a specific artist. I don’t want to give up any spoilers but I would love to share the facts that left the greatest impression on me! 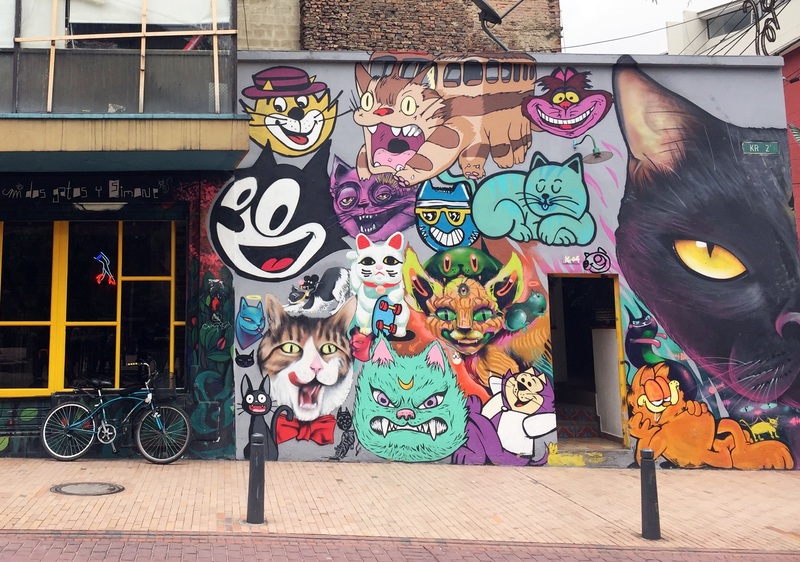 There has been a lot of controversy in the last decade whether or not graffiti should be legal in Bogota and Justin Bieber is personally involved in one of the stories. How odd is that? Back in 2013, Justin Bieber had a show in the Colombian capital. Right after the concert, he was escorted to 26th street downtown Bogota where policemen guarded him while he was painting the Canadian flag with a marijuana leaf instead of a maple leaf (Justin is a Canadian). Quite creative, don’t you agree? There was a lot of press and photographers to document his act. Can you imagine the street art society’s reaction? “If he can do it legally, so can we” – they thought. The following day hundreds of artist went on the streets. The police couldn’t do anything to stop them. First, the crowd set out to paint over Bieber’s art. Of course, they didn’t stop there. In less than 48 hours, the entire 26th street turned into an art gallery. 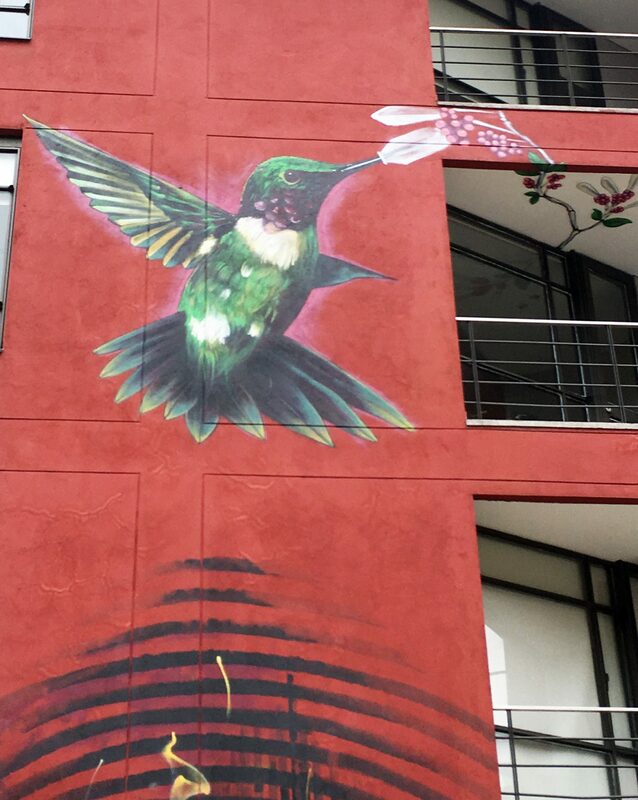 Even before that day, the streets and buildings of Bogota have conveyed the political and social messages of artists from all around the world. 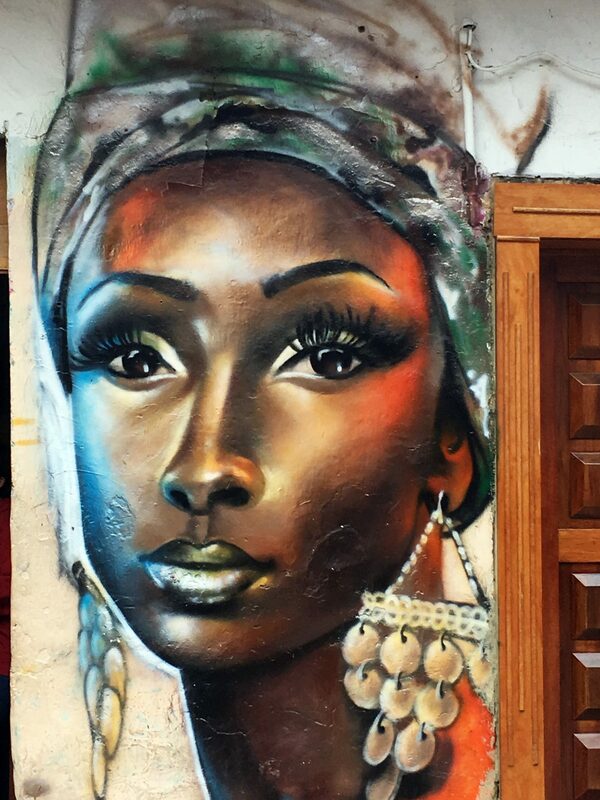 The street art and murals really add a lot of color and character to the otherwise boring urban scenery. Most of the graffiti is made on public buildings or abandoned walls but there is a significant amount painted on private houses and apartments. All the artists need to do is knock on the door and ask for permission. The owners are mostly concerned about the main image and the theme of the artwork. When they find it’s going to be a bird or another animal (80% of the graffiti), they immediately agree. 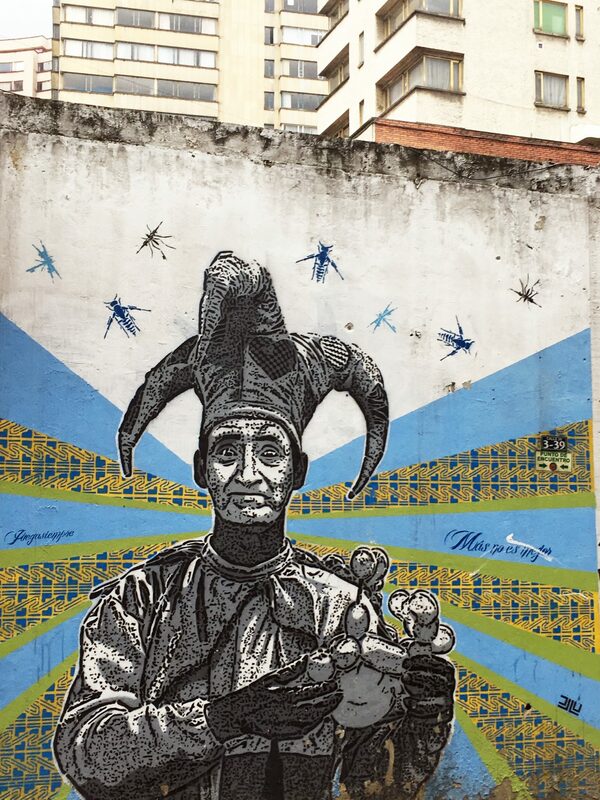 Don’t get me wrong, the graffiti in Bogota is still a strong form of social protest and cultural expression. However, with the improving way of life and the growing middle class, modern artists have lost some preach from their paint. They are more focused on creating art that reveals their skills rather than on a cause. Over the years the designs have become more and more complex. Graffiti artists nowadays use a stencil, spray paint, stickers and wheat-pasted posters. 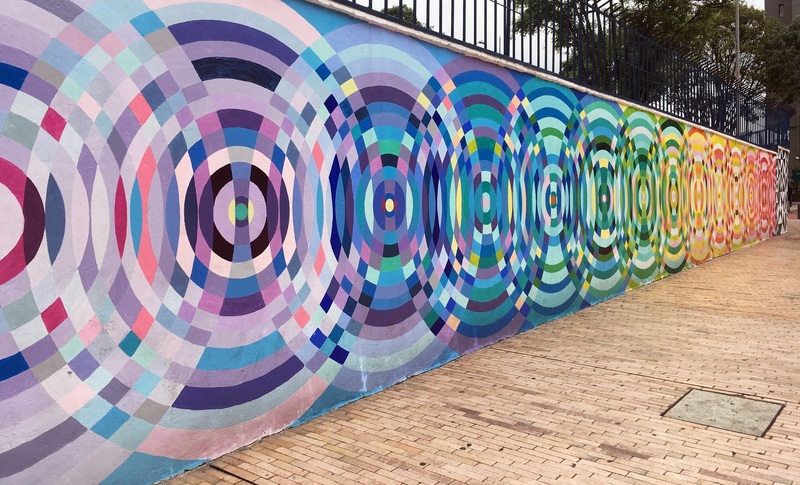 And since graffiti is technically more acceptable in Colombia, artists have the freedom to express themselves as they please. 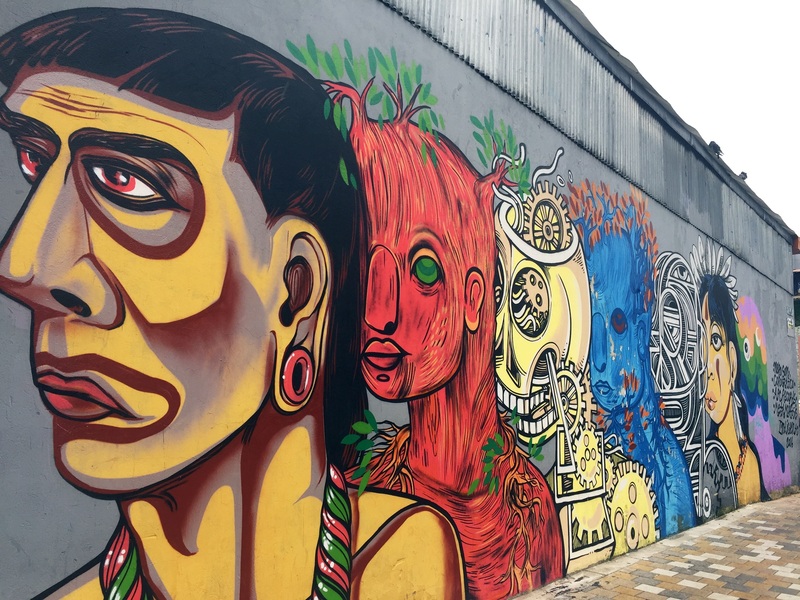 If you would like to learn even more about the works and the people who helped make Bogota such a thriving hotspot of street art, visit the Graffiti tour website or simply, go there and experience it on your own!